There is a history of Northwest Airlines by Frederick L. Johnson in the Winter 2012 issue of Hennepin History magazine. The history of air travel in the Twin Cities actually goes back to a racetrack. 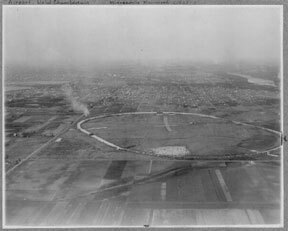 Twin City Auto Speedway, which opened on Labor Day 1915, was located between 60th and 66th Streets and 34th and 46th Avenues on the Mississippi River Bluffs. The speedway was meant to compete with the Indianapolis speedway, which had opened in 1911. They were both built by the same man, F.H. Wheeler. 30,000 people showed up for opening day, sponsored by AAA. 14 cars were to go 500 miles, and included drivers Barney Olfield and co-driver Eddie Rickenbacker. Alas the construction was shoddy, the concrete rough, as cars either fell apart or dropped out. Only six cars finished; the winner was Earl Cooper, driving an American Stutz. After only three more races in 1916 and 1917, the race was run. By the 1920s the concrete had been broken up and the land was leased for farming. All vestiges of the speedway were gone by 1932. There is a comprehensive article about Twin City Speedway in the Winter 2007-08 issue of the Minnesota History publication of the Minnesota Historical Society. Aerial view of Speedway Airfield with racetrack still intact. It was removed between 1927-1932. Alexander T. Heine flew the first airplane over Minneapolis on January 13, 1913. The Minneapolis Aero Club bought the speedway and made it into a flying field in 1919. Speedway Flying Field opened in 1923 on the site of the old speedway. Northwest Airlines was begun as Northwest Airways by Col. Lewis Brittin on September 1, 1926. The company was based in Michigan, but operated from Speedway Field, the site of today’s Minneapolis/St. Paul International Airport. The first flight took place on October 1, 1926, carrying mail from the Cities to Chicago with two rented OX-5 planes with open cockpits. The first passenger flight carried one passenger on an unheated, 12 hour trip to Chicago. On November 2, 1926, Northwest introduced the country’s first closed-cabin commercial plan, which could hold three passengers. Minnesotan Charles Lindberg made his solo flight to Paris May 20-21. The City of Minneapolis Park Commission bought Speedway Flying Field for $165,000. They named it Wold-Chamberlain Field in honor of two local fliers who died in WW I. 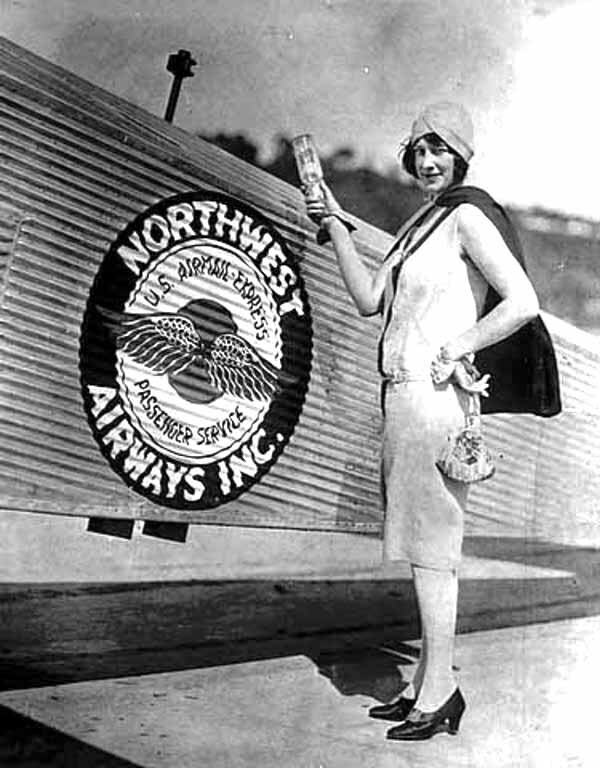 The first paying passenger on Northwest flew to Chicago on July 5, 1927. At the controls was “Speed” Holman, legendary local pilot. A one-way ticket cost $40, which would be nearly $500 today. The flight took 12 1/2-hours, including stops in La Crosse, Madison, and Milwaukee. Northwest carried 106 passengers in the first late-summer season of 1927. Wold-Chamberlain Airport became Municipal Airport. On July 1, 1930, Northwest moved its fleet to St. Paul’s Holman Field (now the downtown airport) named after local hero Speed Holman (see below). On December 4, 1933, Northwest made its first flight over the Rocky and Cascade mountains to Seattle. The company became Northwest Airlines on April 16, 1934. Amelia Earhart was lost during her attempt to circle the earth. In 1939 the DC3 was introduced, as were Northwest’s first stewardesses. Before the war Northwest was said to only hire pilots who had received their training from the Navy in Pensacola. During the War, the Federal government commandeered half of Northwest’s fleet, and service to smaller venues was reduced. In the summer of 1947, Northwest began service from the Twin Cites to Tokyo, Seoul, Shanghai and Manila. Northwest would grow to become a major player in the Pacific. And the airline took on a new name — Northwest Orient. On August 1, 1949, Northwest became the first airline to offer beverage service within the U.S., on the Boeing Stratocruiser. In 1954 North Central Airlines recruited 50 women to replace men as stewardesses. There was much competition for these coveted spots. In 1956 Northwest’s operations moved back to Speedway Flying Field, which had become the $17.5 Million Wold-Chamberlain Field. 1959 saw Northwest’s first jet. 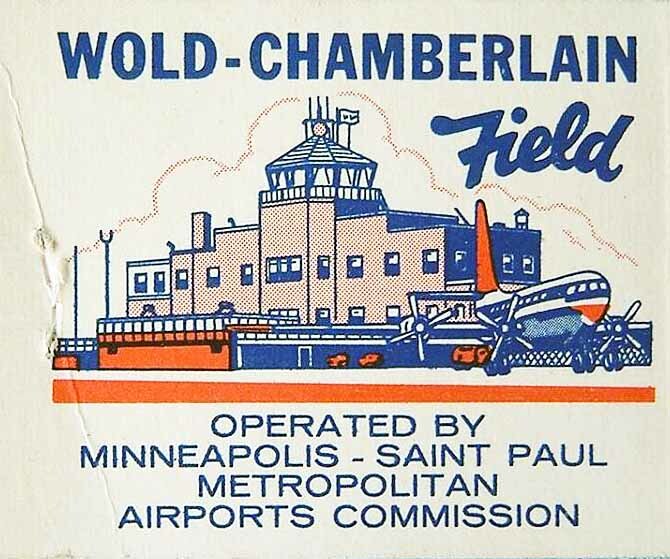 Twin Cities International Airport opened in 1962 at the site of old Wold-Chamberlain, which cost $8 1/2 million. In August 1987 a Northwest MD-80 jet crashed in Detroit as it attempted to take off. An eyewitness described the scene: “Within seconds the flames got bigger, and the plane was on fire, and seconds after that it exploded. Great big explosion. It was airborne, but it was having troubles, and we looked and it was on fire.” It was the worst accident in Northwest’s history — 156 people died in the crash. One child survived. In 1988 Northwest Airlines was the first airline to ban smoking on board. A Northwest Airlink flight crashed at Hibbing in 1993, killing all 16 passengers and both crew members. On October 25, 2002, Senator Paul Wellstone, along with seven others, died in an airplane crash in Eveleth, Minnesota, at approximately 10:22 a.m. He was 58 years old. The other victims were his wife, Sheila; one of his three children, Marcia; the two pilots, his driver, and two campaign staffers. Charles W. “Speed” Holman (12/27/1898-5/17/1931). Holman Field in downtown St. Paul was named after him. As “Jack Speed” he raced motorcycles and did parachute jumps in a flying circus before he took up aviation in 1920, specializing in tricks and loops. In 1926 he became Northwest’s first pilot. He set a record in 1928 for most consecutive loops – 1433 over the course of 5 hours above the downtown St. Paul airport which was named after him. By 1929 he was Operations Manager of Northwest. Holman was killed at an air show in Omaha in 1931 when he hit the ground during an exhibition. The accident could have been due to a failed seatbelt.